Recently refurbished. Ideal Apartment for relaxing holiday with sea view and wifi. This 1st floor, split level, privately owned end-apartment is situated in a quiet area of S'Algar whilst having all facilities easily accessible, including the use of the swimming pool at Las Palmeras complex which is a couple of minutes walk away. It is a large and airy apartment with white walls and an apex roof with timber beams. A balcony provides a panoramic view of the sea and the sunroof (which sees the sun all day) provides a 360º view of the coastline, S'Algar and the surrounding countryside. Air conditioning available in the two bedrooms. Double glazing throughout so suitable for year round accommodation. New washing machine and drying area on rear balcony. Sony Bravia 32" HD LCD FlatscreenTV. Safe Deposit Box available. 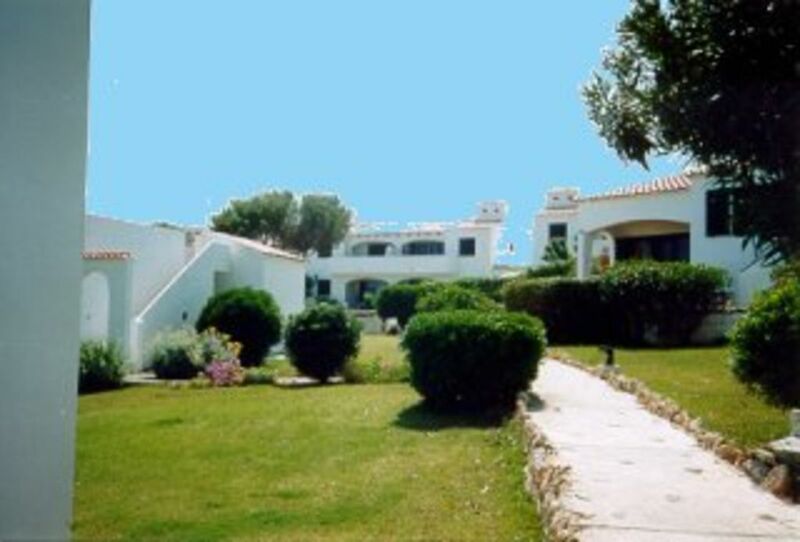 The owners are connected with a family business and have been visiting Menorca since 1986 when after a 2 week holiday in the S'Algar Hotel the family decided to purchase a property in the area as the island was very different to other Balearic Islands and provided a totally relaxing experience.........& safe for the younger family members. Diane, who has been employed by the owners for over 30 years, handles all the reservations and can provide additional information as a regular visitor to the Apartment. We are relaxed and easy to deal with and after 30 years on the Island have a regular clientele of guests as we have always charged a fair rental and appreciate our regular visitors who love S'Algar and the Island as much as we do. The family jointly owned a 4 bed villa for 12 years and 'downsized' to this well sized but easily manageable apartment when the children moved on..........they now visit with their families of course. You will find ex-pat permanent residents in these properties who are always willing to be helpful should you have any questions about S'Algar, whilst you find your bearings, or the Island in general. Total relaxation and the opportunity of some fabulous restaurants both in S'Algar & San Lluis the local town. If you wish to meet people, you will find neighbouring residents and regular visitors both friendly & welcoming in the bar/restaurants in 'The Square'. The first floor sun-roof is totally private if you just want to 'crash out' and sunbathe. Fully tiled modern bathroom with bath, shower, basin & wc. As the accommodation is situated at the end of the block, there is the benefit of an opening window. Mobile Heaters are available in the event of a cold spell. There is a car park for the International Apartments or you can park on the roadside. Lounge with one 3 seater and one 2 seater settees. Sky TV with limited channels. CD player. Kitchenette with electric hob & oven, fridge/freezer, microwave, electric kettle and toaster. High Chair is available from the local management and can be arranged in advance. We encourage our visitors to leave any books which have been read and swap a similar number for any in the Apartment. Community Gardens are regularly attended to through our maintenance charges. Sun roof terrace provides 360 degree views and sun bathing opportunities all day. 18 hole @ Son Parc - 25 min.drive. Clubs can be hired & attractive bar/restaurant overlooks the Course with a lovely beach only minutes away. NOTES ON ACCOMMODATION: Electricity cost inclusive. Las Palmeras Pool, restaurants, supermarket and children's play area are all in close proximity.......3 minute walk. No pets allowed. Bus service available to various parts of the Island. Cot and/or high chair available from local Management. OUTSIDE: Sunloungers and chairs on 1st floor roof terrace. Outdoor furniture on front balcony. UTILITY ROOM: Washing machine / drying area. Cleaning / Towels / Linen / Maid service: Linen and small towels included. Weekly clean and linen change included. You are requested to strip beds and leave linen for collection at the end of the first week and/or at end of your stay. You will be provided with contact details of the Local Management. OTHER: Balcony with appropriate furniture. Sunroof with chairs and sunloungers (access door can be locked if necessary for safety purposes for young children). Menorca Cricket Club arrange fixtures for tourists in main summer season. Further details from Owners. The coast is a 5 minute walk away - approximately. Mahon airport is 20 minutes by car/taxi. Car hire is not essential but is recommended to see the island's magnificent beaches and visit numerous value-for-money restaurants. Arrangements can be made for a car to be provided at the airport or delivered to the apartment upon request (discount rates to guests on all vehicles). Sant Lluis is the local town - 10 mins by car/bus. Peaceful tranquility and an unhurried way of life describes Menorca with its whitewashed villages, situated in lush green countryside and crystal clear waters. It is known as the 'blue & white island' and offers over 100 beaches, rocky coastlines, hidden coves & grottos making for some wonderful diving sites. There is a diving centre in S'Algar which includes parascending.